What’s the relationship between your mindset and your fundraising campaigns? That’s exactly what we set out to answer this morning at NYN Media’s Nonprofit Fund Con. 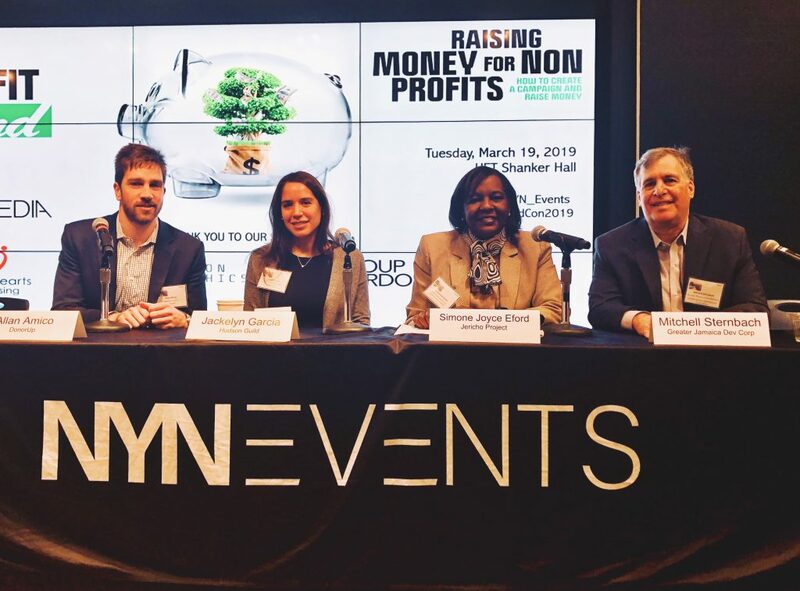 NYN Media brought together fundraising and development executives from nonprofits across New York for a variety of panels and networking opportunities on creative campaigning and raising money. We were honored to be included in such impressive company, as DonorUP Founder and CEO Allan Amico moderated the first panel of the day: The Importance of a Fundraising Mindset to all of your organizational communications. (from L to R) Allan Amico, Jackie Garcia, Simone Joye-Eford, and Mitch Sternbach. Allan led a discussion examining the current state of fundraising, how nonprofits can take responsibility for creating and managing engaging campaigns, and what ingredients go into writing successful grant proposals. The underlying theme: your mindset. A fundraising (growth) mindset empowers nonprofit leaders to build more proactive campaigns, strategy, and has a higher rate of “yes!” from potential donors. It’s the key to nonprofit/donor relationships and thus donor retention. Simone, Mitch, and Jackie all agreed on the power of social media and the importance of thoughtful content curation across relevant platforms (think Twitter, Instagram, and Facebook), understanding that each platform invites a different audience and thus a wide base of potential donors. What must be taken into consideration, however, is the notion of content as a form of currency. On one hand, social media is an incredible low/no cost way to give shout-outs and personally thank donors. And as a campaign tool, an organization can maintain relationships while delivering updates and a climate of transparency regarding where donor dollars go. On the other hand, as an organization, you want to be thoughtful about who is getting a shout-out, when, and why. There’s a delicate balance to be had in making sure social media moments are meaningful. To effectively connect with potential donors, you must be authentic to your organization’s mission and voice. There is no precise formula to follow. But every organization may use some of the same ingredients to build a campaign that serves their unique audience(s). In an apt concluding question, Allan asked the panelists to look to the future. Which trends did they expect to see emerge in the next couple of years (and thus how nonprofits can begin to prepare for the success of future campaigns)? Responses ranged from an emphasis on transparency; staying on top of trends to effectively communicate with the rising Gen Z; and the critical element of personalization of messaging for donors. We’ll take this one step further and ask every organization to consider their own mindset and emotional well-being when it comes to the potential fatigue of ongoing one-time giving campaigns. How can transparency, personalization, and retention best be served? The answer may rest with smaller, recurring donations from a loyal donor base. We thank NYN Media for including us in a great conference and for providing organizations with the tools they need to meet their goals.